NEW YORK, NY--(Marketwired - Jan 14, 2015) - In Manhattan, good design is as important to daily life as a wardrobe of black clothing. But even in this city where only the best architectural projects earn a place on the pavement, there are stars, and the Residence Inn New York Manhattan/Central Park is one of them. This exquisitely designed Central Park hotel in NYC impresses visitors with dramatic vistas and an impeccable aesthetic. And, as evidenced by its recently earned Gold Key Award for Excellence in Hospitality Design, it's impressing the critics as well. On November 10, 2014, the 34th-annual Gold Key Awards honored properties completed or renovated between March 1, 2013 and March 1, 2014. This New York hotel near Central Park received its Gold Key Award for Best Guest Room in its category. Competition was stiff with more than 280 international projects under consideration, but the property's beautifully appointed guest rooms easily stole the spotlight. Each of the 261 suites incorporates plush linens, ergonomic work spaces, quiet nooks for relaxing and kitchenettes. But the hotel's enviable location along the NYC skyline affords one of its biggest advantages: the views. 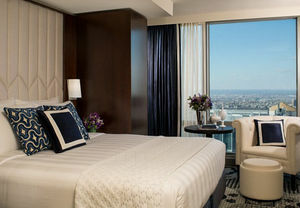 Unique among hotels with a view of Times Square, Central Park and the Hudson River, this property stretches upward for more than 750 feet with 68 stories -- and the suites capture all the ensuing splendor with floor-to-ceiling windows. While the hotel's record-breaking features are impressive (it is the tallest hotel in NYC, after all), it's the meticulous interior design that earned it a Gold Key Award. Envisioned and executed by Bill Rooney Studio -- the same firm behind such illustrious projects as The Peninsula Chicago's guest room renovations -- each suite's interior design feels like a sanctuary. A soothing palette of neutral hues is punctuated by jewel-toned accents in draperies and pillows, while rich woods and lacquered surfaces create sumptuousness. Quilted wall treatments, meanwhile, stand in for traditional headboards in a nod to the sort of creativity only the best projects allow to flourish. While the guest rooms won the award, the rest of the hotel is just as stylish. Sleek furniture, modern light fixtures and a sophisticated palette of shades and colors create a design tempo in the sitting area, dining venues and meeting rooms that feels in step with the rest of the city. And considering that Manhattan represents the pinnacle of what's new and exciting, the Residence Inn New York Manhattan/Central Park is poised to offer guests a one-of-a-kind welcome to the City That Never Sleeps. Whether visitors arrive on vacation, for business or during an extended stay, the Residence Inn New York Manhattan/Central Park is designed to impress. Not only is the building itself the tallest hotel in North America, but its location affords easy access to all the best attractions like Broadway theaters, Fifth Avenue shopping, Rockefeller Center and more. After a busy day of sightseeing or meetings in the hotel's seven state-of-the-art meeting rooms, guests can indulge in the hotel's many amenities. Studio suites, for example, offer complimentary Wi-Fi, grocery-shopping service to outfit the suites' kitchenettes, plush bedding and ergonomic workspaces. Plus complimentary daily breakfasts, a fitness center and an outdoor event space address practical needs, even as the hotel, with its Central Park views and modern style, never fails to inspire. On November 10, 2014, the 34th-annual Gold Key Awards honored properties completed or renovated between March 1, 2013 and March 1, 2014. The Residence Inn New York Manhattan/Central Park received its Gold Key Award for Best Guest Room in its category. Learn more about our great location near Times Square! Find the right package for your NYC stay!